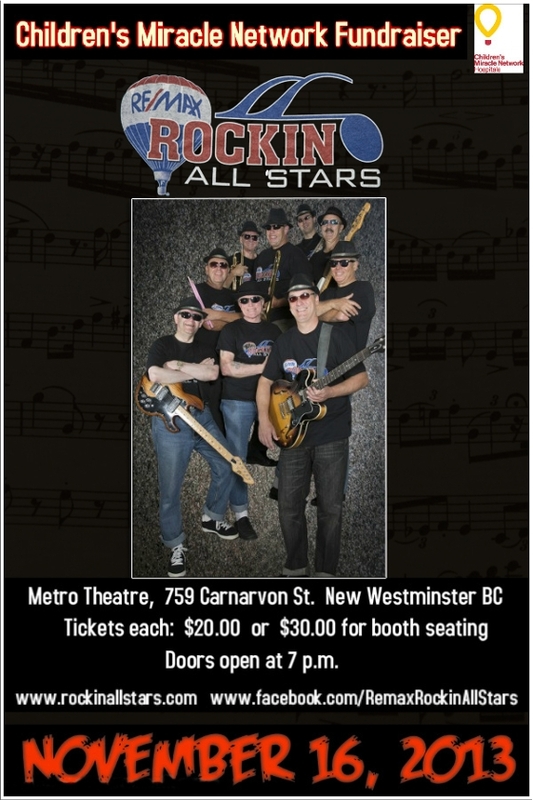 The RE/MAX Rockin' Allstars are a group of full-time RE/MAX agents who are also accomplished musicians. We are proud to announce our involvement in an upcoming event aimed at raising money for the Children's Miracle Network. Dale has three young grandchildren and I have two small children so the health, well-being and quality of lives for our children and all children is something we feel very strongly about. We believe in the work of the Children’s Miracle Network which is why we each donate a portion of every transaction to this organization. We hope you will support in any way you can as well. Join us on November 16th in New Westminister (poster has details below) as the funds raised go to help children in need. An added bonus is getting to hear your Realtor in action as musical entertainment.